“Mensch tracht, und Gott lacht” is a Yiddish proverb – men plan and God laughs. Woody Allen puts the same thought this way: “If you want to make God laugh tell him about your plans”. Some people might see these words as a fitting epitaph for forward guidance on monetary policy. The Bank of England has certainly faced a good deal of criticism for the guidance that it has recently been giving, as has the Federal Reserve in the US. In both cases the nature of the guidance has evolved, though I think it is rather harsh to assume that God has been laughing at how things have gone; anyway it is hard to know. Yet there is a real question here that is worth thinking about: What is the most useful way for a central bank to provide information about the way in which it will set monetary policy? Consider a spectrum of choices a central bank might face about what it says about its future policies. At the minimalist end of the spectrum (which we might associate with Montagu Norman)1 is just a statement that the central bank will continue to do what it sees as most appropriate over time. At the other end of the spectrum is an explicit commitment that policy will be set in a specific way at each point in the future – not just a rule that might be followed but a commitment to a particular policy setting. Between these two are a great many intermediate points. Nearer the vague end is a statement of the goal of policy (e.g. an inflation target) but little beyond that. Further along again might be an assessment of how the policy set by the central bank might evolve for different outcomes of some of the main forces driving the economy. That would tell you something about the central bank’s reaction function. Or the central bank could give an explicit forecast of what it thinks its most likely future policy will be. I think it is helpful to think about forward guidance as being a choice about which point to settle on along the spectrum I have described. There is not a lot of generally agreed-upon and directly applicable economic theory to help with this. To a large extent this is because in many standard economic models this is a bit of a non-question. If everyone in an economy is completely rational, has unlimited computational powers, has the same information, and understands the processes driving the economic outcomes, then so long as the central bank tells people what its goals are then there is not much more to be said. People outside the central bank will work out what the optimal policy will be for the central bank to follow given how the economy seems to be evolving. Everyone will form the same expectations about the course of future policy. The main point is that when everyone shares common information and understanding (and that is the default assumption in many economic models) the central bank just needs to say what its aims are. Of course this is very unrealistic. So it is not a very good guide to the practical policy issue about what guidance the central bank should give. Much of the most vocal recent criticism of guidance given by central banks really reflects a seeming preference to take one of the extreme ends of my spectrum. The Bank of England is very often criticised for ‘flip-flopping’ – for giving different signals about policy at different times, for seeming to change its mind on the right path for policy – in short, for not providing certainty about policy. I think in many cases this boils down to the criticism that while the Bank of England now claims to be giving guidance on policy, it is not saying what policy will be – it is not giving a specific path for interest rates, and not even saying when it is going to start raising rates. And it is true that the Monetary Policy Committee (MPC) could commit to a certain path for future interest rates, and stick to it whatever economic circumstances materialise. Indeed the more uncertain the economic environment, the more valuable might people find it to have certainty about where interest rates are heading. Yet the greater the uncertainty, the greater are the chances that the economic environment will turn out to be very different from what the MPC expected at the time they committed to an interest rate path. And this means that sticking to that path can be very costly. My aim is to assess how much of a difference it would make if the central bank fixed the path for policy over the next few years rather than making it conditional upon the way the economy actually pans out. I calibrate the uncertainty about the size of the output gap, the impact of monetary policy, the growth momentum in the economy, and the path of productivity. I also specify the aim of the central bank as being to try to keep inflation close to a target and output close to its estimate of the supply capacity of the economy. I then compute an optimal policy rule showing how the interest rate should respond to the (uncertain) evolution of actual inflation and output so as to best achieve the aims of policy. Figure 1 shows the resulting probability distributions for the path of Bank Rate. Along the central path (that is the median where 50% of the outcomes are with lower interest rates and 50% have higher rates) the level of Bank Rate rises gradually. But it remains materially below its pre-Crisis average of around 5% even after four years. Figure 1 also shows that things may turn out quite differently from the central path. This simple model suggests that there is a 10% chance that the appropriate level of Bank Rate increases to above 5% within 18 months (the line labelled ‘90th percentile’). It also shows that there is a 10% chance that the appropriate level of Bank Rate is around zero for two years to come and is only just over 1% even four years ahead (the line labelled ‘10th percentile’). How does a policy of fixing the interest rate for a three- or four-year horizon look in the light of this model? Not very attractive I should say. Suppose that interest rates are set at the outset so that they follow the central (median) path. On average this is an appropriate policy – but in the light of how things actually evolve it could be very different from the interest rate that would be appropriate based on what actually happens to inflation and output. How wrong could it be? Well, four years ahead the interest rate to which the central bank commits at the outset if it fixes policy at what is (ex ante) the average outcome could, with about 10% probability, be at least 2.5 percentage points too low, and with 10% probability it could be at least 2 percentage points too high. Having interest rates that far from the right level, and for an extended period, seems to me a very high price to pay for the certainty of following a given path for interest rates. It would probably generate outcomes that were wildly unstable. I don’t think that is a bad summary – in everyday language – of what Figure 1 shows. It is also pretty much the message on policy that the MPC at the Bank of England have been giving for some months. Whether or not something more precise and quantified than this broad description is useful is the issue I want to turn to next. Are precise probability statements good guidance? One type of guidance is for the central bank to provide an expected path for the policy rate (for example the median path shown in Figure 1 above). But without giving some idea about how likely it is that policy will be close to this path, this may not be particularly useful – and it could be seen as more of a commitment than an expectation. Quantifying that uncertainty is tricky. One might just draw on the volatility of past interest rates (around some previously expected path) as a guide to uncertainty in the future. Or a stochastic simulation using a monetary policy rule could be used to derive fan charts for the policy rate. The policy rule could be (an approximation) to an optimal rule – which is one way to interpret Figure 1 above. So the MPC could use a mechanical procedure that is some sort of very rough approximation to its decision-making so as to produce a fan chart for interest rates. But there is no getting around the fact that constructing fan charts of interest rates that represent the MPC’s view of the probability of different paths presents many problems. It involves, for example, the quantification of the chances of various events happening which may go beyond what can meaningfully be done. The apparent precision of probability statements in a world of uncertainty (not just risk) can be misleading. Currently, it might be just as useful – and probably less misleading and possibly even more accurate – to give forms of guidance which are more qualitative, such as: “Interest rate rises will probably be gradual and likely to be to a level below the old normal”. That says something substantive; and most people can understand it. Disclaimer: This is the view of David Miles and not that of the Monetary Policy Committee at the Bank of England of which he is a member. 1 In recognition of his reputed dictum “never apologise, never explain”. 2 Woodford (2013) has an extensive discussion of the conditions under which the optimal monetary policy of a central bank might be time inconsistent. This depends upon the nature of the goals of the central bank, which need to be precise enough to determine a policy path. The key condition is that “…the sequence of target criteria for different horizons are of the same form (i.e., if the target criterion is independent of the horizon)… then the forecast-targeting procedure will be inter-temporally consistent.” I believe that the way the MPC at the Bank of England interprets its goals satisfies this condition. Miles, D (2014), “Mensch tracht, und Gott lacht: Giving guidance on future monetary policy” Speech at the London School of Economics, 30 September. Woodford, M (2013), “Forward Guidance by Inflation-Targeting Central Banks”, CEPR Discussion Paper 9722, November. Professor David Miles joined the Monetary Policy Committee at the Bank of England in June 2009. He is also a Visiting Professor at Imperial College. Miles was formerly a professor of financial economics and head of the Finance Department at Imperial. As an economist he has focused on the interaction between financial markets and the wider economy. 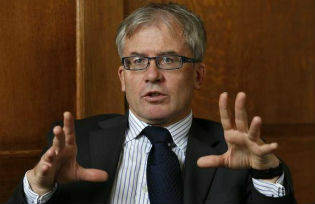 He was Chief UK Economist at Morgan Stanley from October 2004 to May 2009.